Today, a Vatican delegation brought greetings and well wishes to the Orthodox Church on this feast of St. Andrew, the feast of the Ecumenical Patriarch of Constantinople. There is a traditional exchange of delegations for the respective feasts of the Patron Saints: 29 June in Rome for the celebration of Sts. Peter and Paul, and 30 November in Istanbul for the celebration of St. Andrew. Cardinal Kurt Koch, president of the Pontifical Council for Promoting Christian Unity, led the delegation, accompanied by Bishop Brian Farrell and Msgr. Andrea Palmieri, respectively secretary and under-secretary of the dicastery. In Istanbul they were joined by the apostolic nuncio in Turkey, Archbishop Paul F. Russell. The Holy See delegation took part in the Divine Liturgy presided by His Holiness Bartholomew in the patriarchal church of St. George (Phanar), met with the Patriarch and conversed with the Synodal commission responsible for relations with the Catholic Church. Cardinal Koch consigned to the Ecumenical Patriarch a handwritten message from Pope Francis at the end of the Divine Liturgy, and a gift. It gives me great joy, Your Holiness, to renew the tradition of sending a delegation to the solemn celebration of the feast of Saint Andrew the Apostle, patron of the Ecumenical Patriarchate, in order to convey my best wishes to you, my beloved brother in Christ, as well as to the members of the Holy Synod, the clergy and all the faithful gathered in remembrance of Saint Andrew. In this way, I am pleased to respond to your custom of sending a delegation of the Church of Constantinople for the feast of Saints Peter and Paul, patron saints of the Church of Rome. 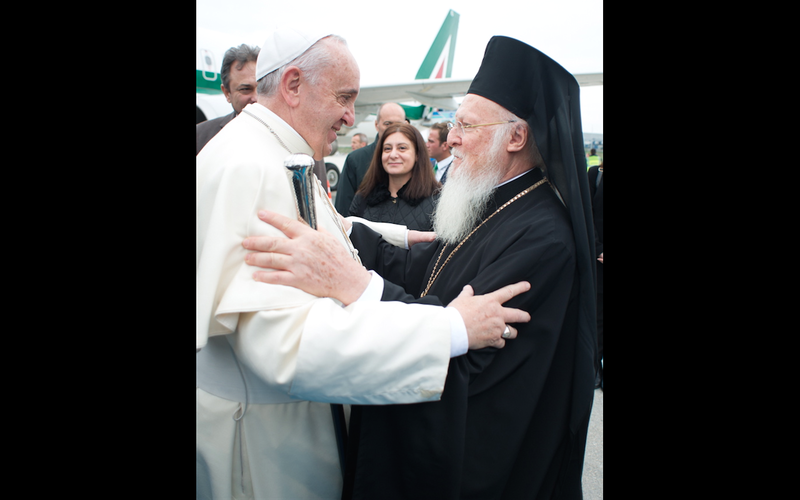 The exchange of delegations between Rome and Constantinople on the occasion of the respective feast days honouring the brother apostles Peter and Andrew is a visible sign of the profound bonds that already unite us. So too, it is an expression of our yearning for ever deeper communion, until that day when, God willing, we may witness to our love for one another by sharing the same eucharistic table. In this journey towards the restoration of eucharistic communion between us, we are sustained by the intercession not only of our patron saints, but by the array of martyrs from every age, who “despite the tragedy of our divisions… have preserved an attachment to Christ and to the Father so radical and absolute as to lead even to the shedding of blood” (Saint Pope John PaulII, Ut unum sint, 83). It is for Catholics a source of real encouragement that at the Great and Holy Council held last June in Crete, the strong commitment to re–establishing the unity of Christians was confirmed. Ever faithful to your own tradition, Your Holiness has always remained conscious of existing difficulties to unity and has never tired of supporting initiatives which foster encounter and dialogue. The history of relations between Christians, however, has sadly been marked by conflicts that have left a deep impression on the memory of the faithful. For this reason, some cling to attitudes of the past. We know that only prayer, common good works and dialogue can enable us to overcome division and grow closer to one another. Thanks to the process of dialogue, over the last decades Catholics and Orthodox have begun to recognize one another as brothers and sisters and to value each other’s gifts, and together have proclaimed the Gospel, served humanity and the cause of peace, promoted the dignity of the human being and the inestimable value of the family, and cared for those most in need, as well as creation, our common home. The theological dialogue undertaken by the Joint International Commission has also made a significant contribution to mutual understanding. The recent document Synodality and Primacy in the First Millennium. Towards a Common Understanding in Service to the Unity of the Church is the fruit of a longstanding and intense study by members of the Joint International Commission, to whom I extend my heartfelt gratitude. Though many questions remain, this shared reflection on the relationship between synodality and primacy in the first millennium can offer a sure foundation for discerning ways in which primacy may be exercised in the Church when all Christians of East and West are finally reconciled. I recall with great fondness our recent meeting in Assisi with other Christians and representatives of religious traditions gathered to offer a united appeal for peace throughout the world. Our gathering was a joyful opportunity to deepen our friendship, which finds expression in a shared vision regarding the great questions that affect the life of the Church and of all society. Your Holiness, these are some of my deepest hopes that I have wanted to express in a spirit of genuine fraternity. In assuring you of my daily remembrance in prayer, I renew my best wishes for peace, health and abundant blessings upon you and all those entrusted to your care. With sentiments of brotherly affection and spiritual closeness, I exchange with Your Holiness an embrace of peace in the Lord.